A little while ago, my boys expressed a need for bean bag chairs. They like the idea of having somewhere comfy to sit where they can read or chill out that’s not a sofa downstairs or their beds. There’s one chair upstairs in my big boys’ room, left over from the days of bedtime stories while feeding a baby. The little boys don’t have a chair in their room. There is a toybox with some cushions on it, but that’s disappeared under a pile of books and will probably stay that way until I can get a new bookcase (I need to decide where to put it first, we have a lot of books!). So I actually like the idea of them having them each having their own bean bag chair that they can put where they like when they want to sit down. With 4 of them, I wanted to keep things simple. I’d also originally planned to let the boys make them themselves, but we ran out of time in the summer holidays. The design is very simple and is actually the same shape I used for the pattern weights and the kindle pillow. It’s just bigger! My older 3 could definitely have each made their own bean bag chair if we’d not run out of time. 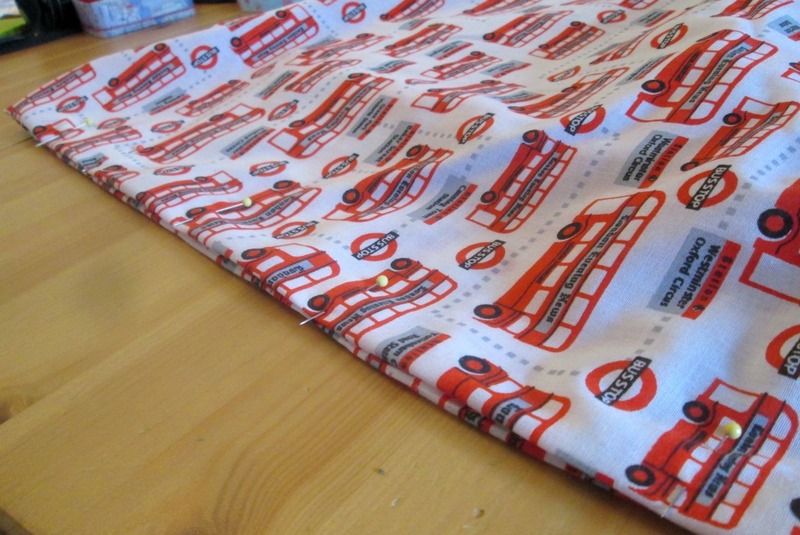 For the fabric, I used polycotton. 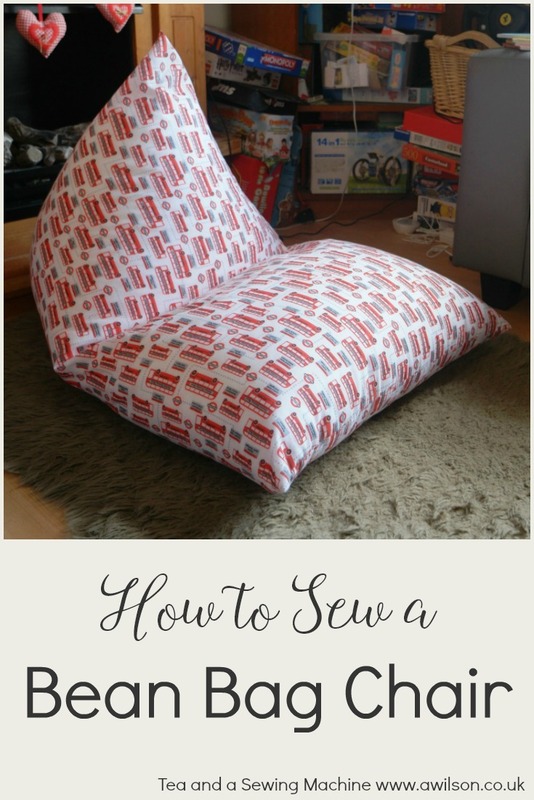 Other bean bag tutorials will tell you to use upholstery weight fabric. For these though, lighter fabric is fine. I also didn’t want to have to spend a fortune on fabric! Thankfully Minerva Crafts have lots of polycotton in dozens of colours and designs at £2.99 a metre! 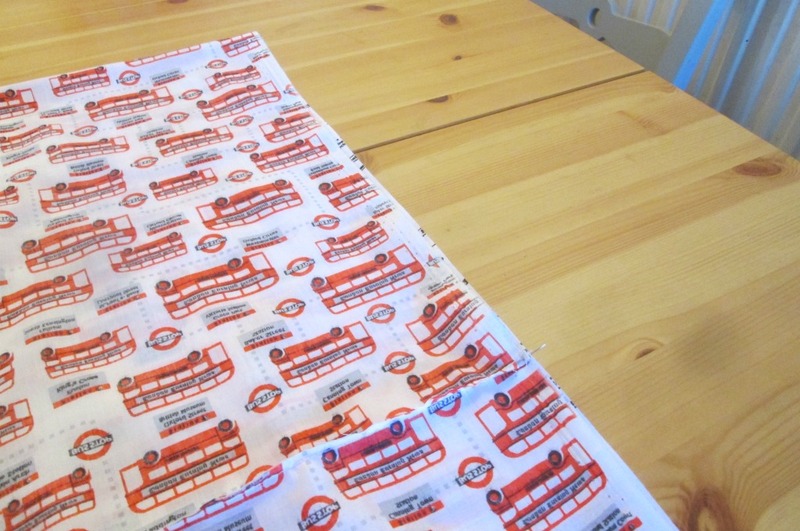 This is an affiliate link, but it is also where I bought the fabric. 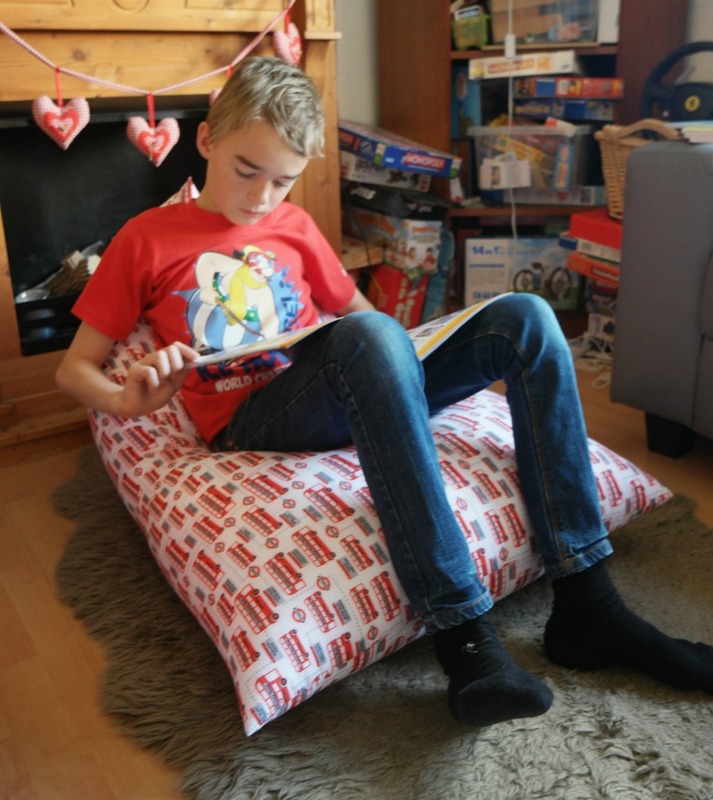 Here are the instructions for making a bean bag chair! 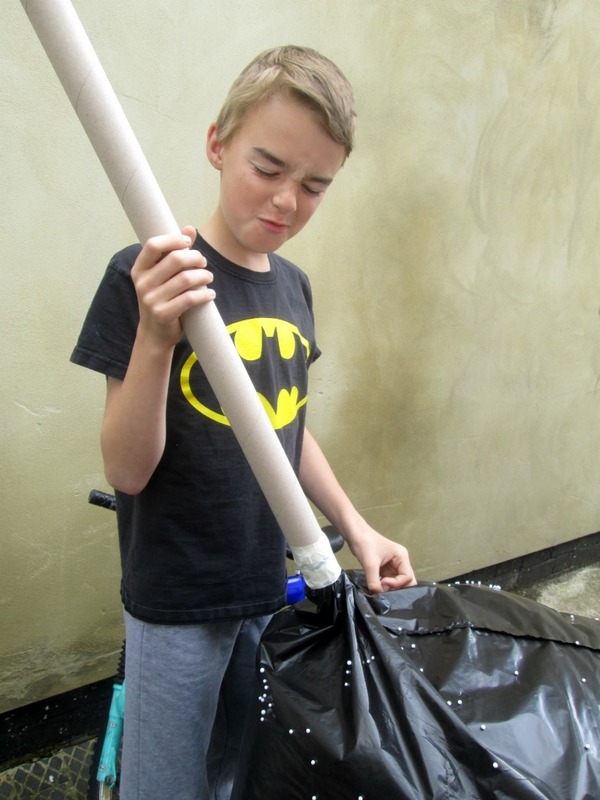 1.5 metres polycotton or other fabric, bean bag filling (5 cubic feet is enough for 1), usual sewing supplies. 1. Take your fabric and cut 1.5 metres. Leave the width as it is. 2. Fold the fabric in half widthways so that the right sides and the selvedges are together. Pin, then sew along the open side and the bottom. Turn it the right way out. 3. Fold the raw edges inwards, then pin the top so that the side seam is in the centre and the top edge is at right angles to the bottom edge. Sew about 2 thirds along so that there’s an opening in the top seam. 4. Pour in the bean bag filling. This will make an almighty mess if you’re not careful and I would not recommend allowing the kids to do this! Don’t overfill it. 3 quarters full is probably enough. To make things easier, I cut the corner off the bag of beans and taped a cardboard tube to the hole. This made things easier as it’s hard to control where the beans go otherwise! The face is because I wouldn’t let him pour it in! 5. Sew up the rest of the top seam. 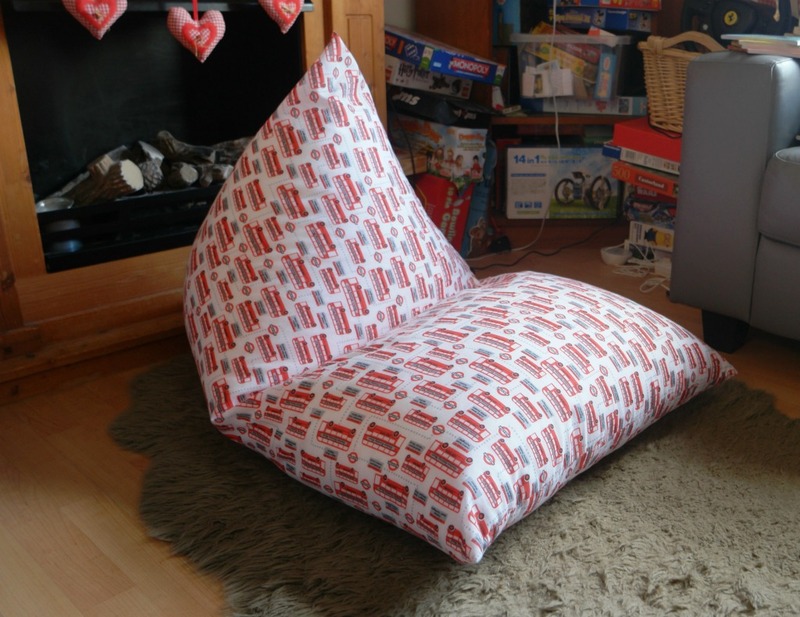 Give it a shake and your bean bag chair is finished! 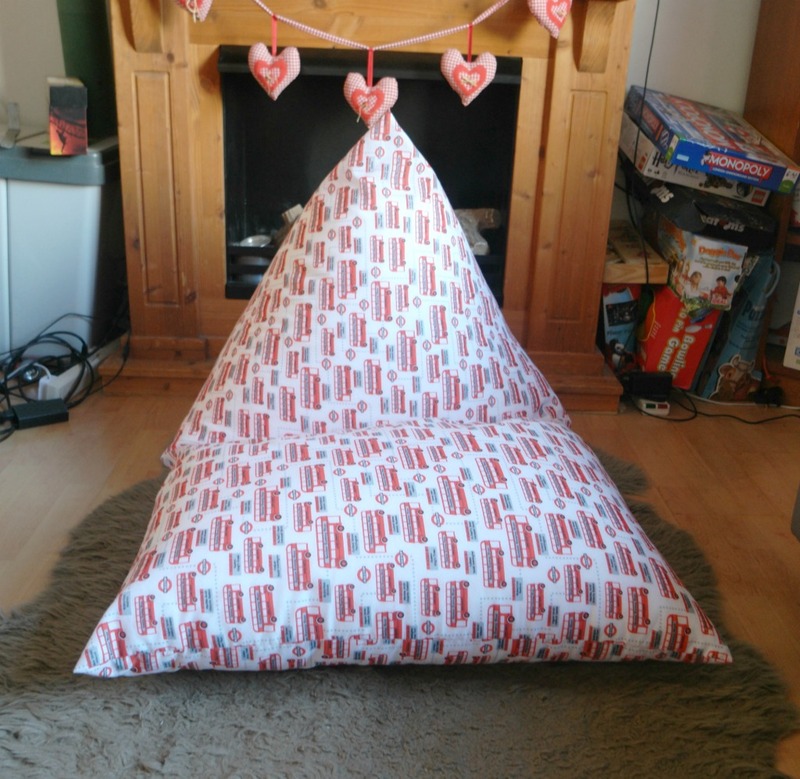 Brilliant, what a great shape for a bean bag chair. 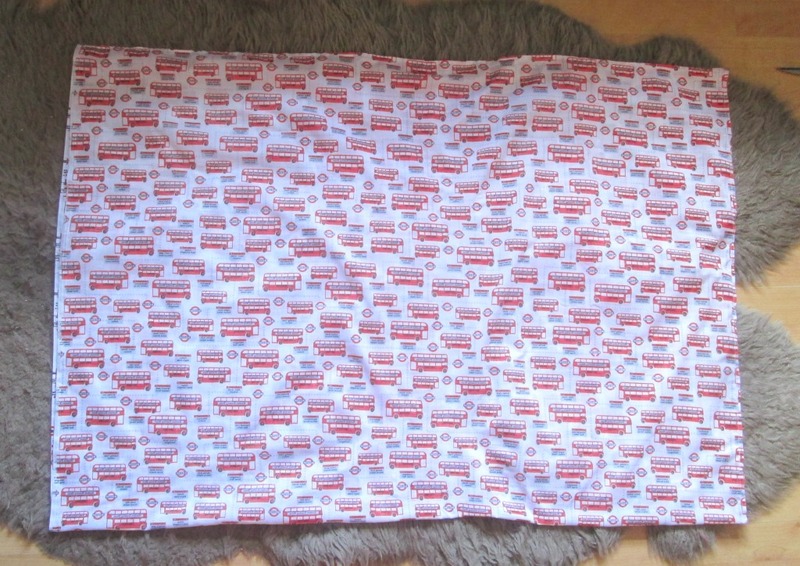 Mine had bean bags in their room when they were younger, they are so useful. Good call on not having too much help with the filling though. Once those little beans escape you spend the next 5 years finding them!! Some have still crept in! Husband found one in the headphones hole in his phone today, he wasn’t happy!